Our strong sense of history and our commitment to maintaining community, tradition, and family is what makes the Cambridge Community Center unique. As we celebrate 90 years of building community together, we hope you will join us and celebrate throughout 2019 at our various events and activities. Stay tuned as we will continue to update this webpage throughout the year with more news and events. 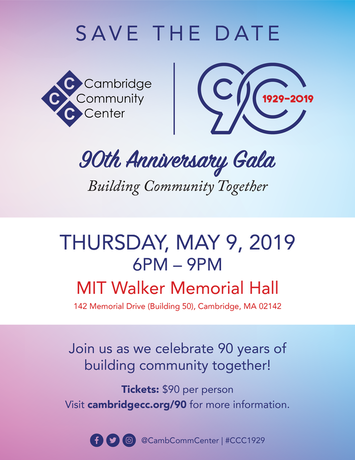 Join us as we celebrate with our neighbors and friends throughout Cambridge and beyond at this special 90th Anniversary Community Block Party. This event is free and open to the public. We'll have food, games, community partners, and much more! Save the date for the 1st Annual Janet "Ms. K" Kendrick Sisters of the Center Brunch. This new annual event is named in loving memory of the late Janet Kendrick, or "Ms. K" as she was affectionately known, CCC's former longtime Executive Director who suddenly passed away on July 14, 2008. The brunch will celebrate women leaders who have positively impacted CCC and Cambridge, serving as the annual event to bestow the Janet Kendrick Sister of the Center Award. Please contact us if you'd like more information regarding the 90th Anniversary Celebrations: 90@cambridgecc.org or 617-547-6811‬.